Select water stocks have more growth potential than many investors might think – and the industry’s largest publicly traded water utility is the best of the bunch. American Water Works (NYSE:AWK) stock has poured money into investors' portfolios over the long term. Since it went public in April 2008, it's has returned 350%. That's nearly four times the S&P 500's 91% total return over the same period. American Water -- like many dividend-paying stocks -- has had a sizable price run-up over the last year and half, which has driven up its valuation. While the pullback that began this summer could continue over the medium term, it remains an attractive investment for the long term. Here are 10 reasons to buy American Water and hold it forever. American Water supplies a product that investors never have to worry might become obsolete or less popular. There are very few products that one can say this about. Tech companies of all stripes could be disrupted. Many consumer product companies are subject to the whims and changing tastes of consumers. Investors in search of a "buy and hold forever" stock also need to consider how likely it is that the way in which a company's product is brought to end users could be disrupted. Let's take electricity, for example. Like drinkable running water, electricity will never become obsolete. However, that doesn't mean that electric utilities can't be disrupted. In fact, their disruption has already started. We should increasingly see more homeowners going "off the grid" by installing rooftop solar systems coupled with energy storage devices. The distribution system for potable water -- via pipes from a central source -- isn't likely to ever change. Unlike electricity, it's a physical product – and a very heavy and high volume one at that. The supply of fresh water is limited and could shrink because the Earth has been in a long-term warming trend. Demand for potable water should grow because the population is increasing, and more people in emerging markets are moving into the middle class. And there's one more huge factor that bolsters the favorable equation for providers: Fresh water has no substitutes. There are various ways to invest in water, but a major reason water utilities are attractive is that their core regulated businesses are natural monopolies. A "natural monopoly" is a monopoly in an industry in which high infrastructure costs and other barriers to entry relative to the size of the market make it very unlikely new competitors will enter it, even if they're legally able to do so. This gives the first company to enter a market a humongous competitive advantage. 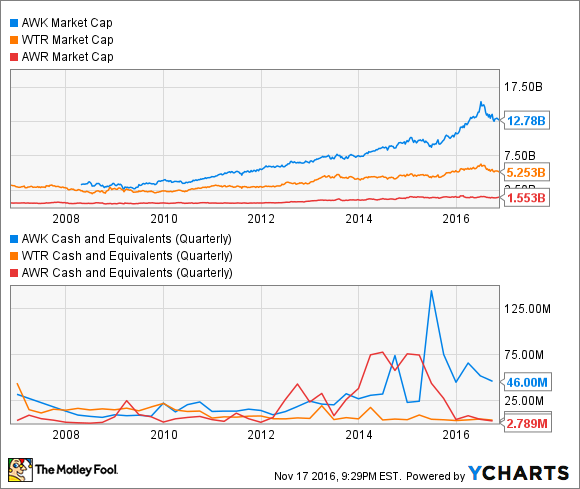 Here's how American Water stacks up to the next two largest players operating in the U.S. -- Aqua America (NYSE:WTR) and American States Water (NYSE:AWR) -- with respect to market caps and balance sheets as of the end of last quarter. (Aqua America had $3.7 million in cash and equivalents; the number is obscured in the chart.) Data by YCharts. That industry-leading size provides it with a significant competitive advantage over its peers in its core regulated business, which accounts for the lion's share of its total earnings. It also provides it with more resources to pursue acquisitions in an extremely fragmented sector. The company's industry-leading geographic diversity also provides it with a considerable competitive advantage. It runs water systems in 47 U.S. states and one Canadian province, and operates as a regulated utility in 16 of these states. Aqua America has regulated operations in just eight states, while American States Water has a regulated business only in California. This wide footprint means that American Water can often expand near its existing operations without adding full new work forces. Moreover, this feature makes it less vulnerable to region-specific challenges, such as droughts. It seems likely that an increasing number of desalination plants -- which convert seawater into drinkable water -- will be built in the U.S., especially in drought-stricken California. If this proves true, American Water's experience in this area could benefit it in several ways. Certainly, experience should help it operate these plants more efficiently. The company operates a desal plant in Tampa, Florida. It also has a desalination project in the works in Monterey, Calif, that's slated to begin operating in late 2019 or early 2020. American Water remains on track to meet its long-term goal of growing earnings per share at an average annual rate of between 7% and 10% through 2020. This is strong growth for a utility -- and, indeed, solid growth for any well-established company. American Water's target is to pay out between 50% to 60% of its net income in dividends. This conservative policy means that the company's yield -- currently 2.1% -- is traditionally among the lowest in the industry. However, there are upsides for investors other than those whose primary goal is maximizing current income. Maintaining a conservative dividend policy means that American Water has more money available to pursue attractive growth opportunities. Moreover, a conservative dividend policy generally means a company has more room for continued dividend hikes. 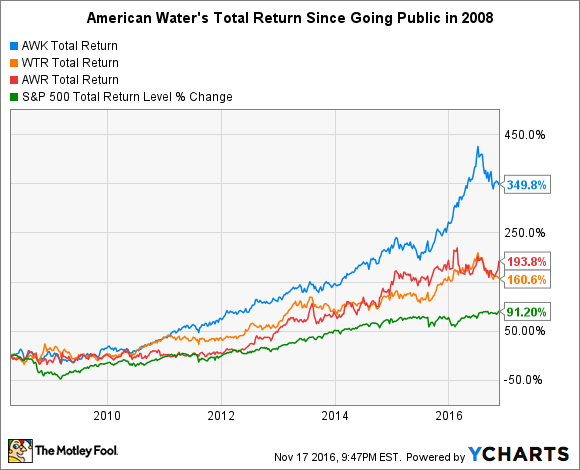 As stated in the opening, American Water stock's total return since its IPO in 2008 is nearly four times the broader market's return, as the chart below shows. The stock has also significantly outperformed Aqua America and American States Water. A stock's past performance doesn't guarantee future performance. However, past performance over the long term provides a good indication of a company's sustainable competitive advantages and how successful top management has been at exploiting those advantages.